[ Nancy Astor, Viscountess Astor, first female Member of Parliament to take her seat. ] 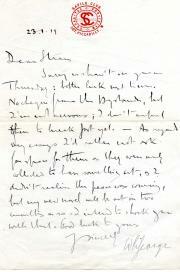 Typed Circular, signed in autograph 'Nancy Astor' and addressed by her to 'Mr. Le Gras', expressing thanks for assistance in her election campaign. 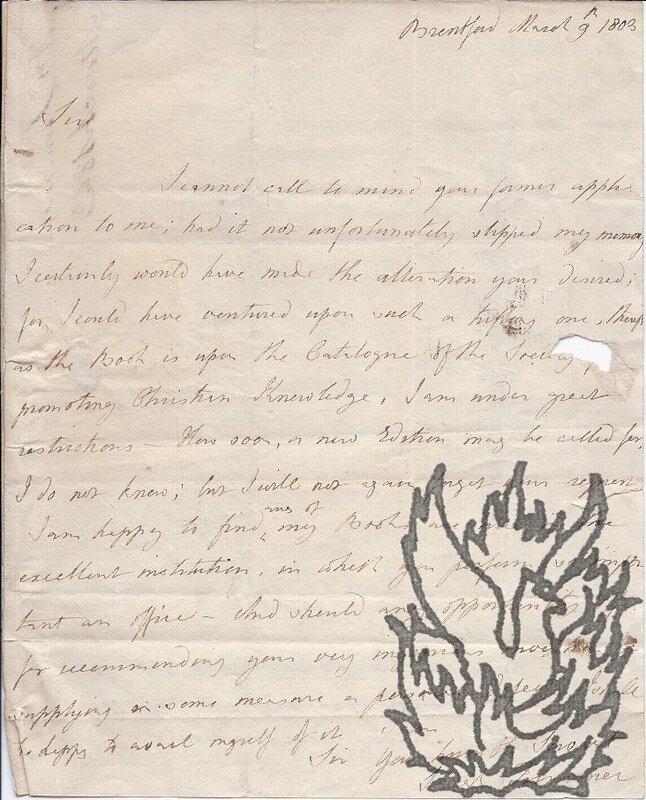 On letterhead of 4 St. James's Square, S.W.1 [ London ]. [ 24 ] November 1919. 1p., 4to. With mourning border. In good condition, on lightly aged and creased paper. A duplicated typed circular, thanking the recipient for 'great and unselfish service during the last fortnight [...] I know you have been fighting for principle and for country [...] Without the personal effort of so many, our campaign could not have been carried out so successfully'. Le Cras's wife was one of Astor's agents in the campaign, and a collection of her papers relating to it are offered separately. 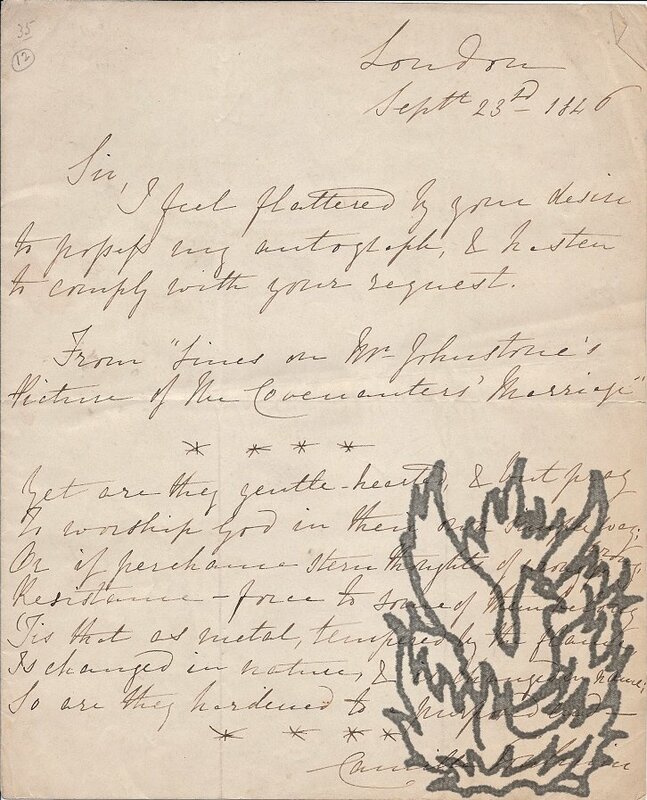 [ Anna Swanwick, feminist ] Autograph Card Signed "Anna Swanwick" to an unnamed correspondent. [Printed address] 23 Cumberland Terrace, Regents Park, NW [London], 14 Dec. [no year]. Card, c.11 x 9cms, rounded corners, both sides used, creased through being bent, good condition, "I beg to say, in reply to your missive, that I shall have great pleasure in complying with your request; Thursday is my only disengaged day this week; I shall be at liberty in the morning from 12 till 1.30 o'ck, & in the afternoon from 2.30 till 4.30, & if you can favour me with a visit, eitther in trhe morning or the afternoon, you will receive a most cordial welcome. For a proivate colloquy the earlier hour may be the safer from interruption; either time will be equally agreeable to me. [Elizabeth Rayner Parkes, campaigner for women's rights.] 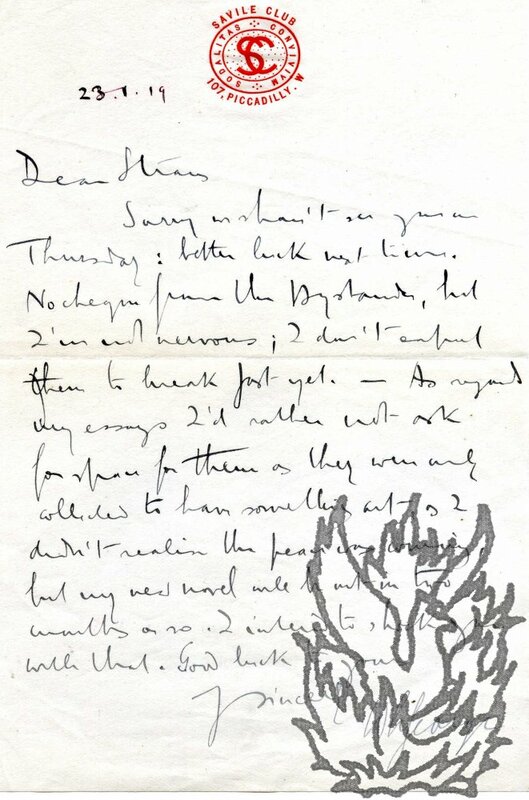 Autograph Letter Signed ('Bessie R Belloc') to an unnamed male recipient, regarding the sending of 'the particulars of my Life', in response to a circular. On letterhead of 11 Great College Street, Westminster. 20 April 1898. [Margaret, Lady Rhondda.] Autograph Card Signed ('M. R.') to 'Dear John', apologising for 'having been so rude to my fellow guest' at a lunch, and admitting that she is 'ridiculously [...] touchy' about her magazine 'Time and Tide'. 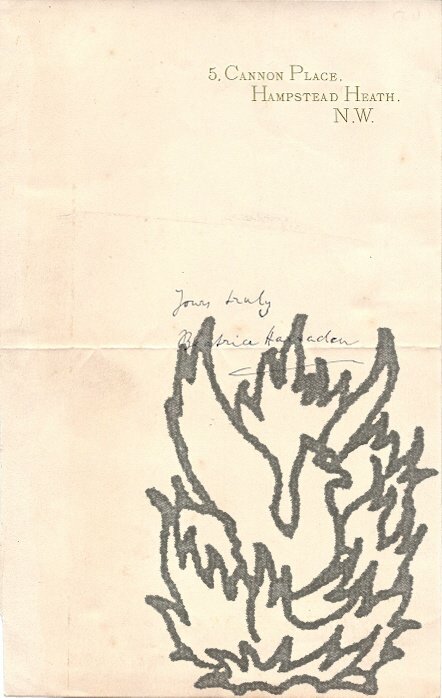 On letterhead of 'Time and Tide', 32 Bloomsbury Street, London WC1. 10 December 1952. Written over 13 lines on both sides of the 9 x 11 cm card. In good condition, on lightly-aged paper. 'Dear John, | I do feel ashamed of having been so rude to my fellow guest yesterday - It was a dreadful thing to do! The fact is I am, I suppose, very touchy about Time & Tide - ridiculously so really - I don't think he had read it - but after all why should he, poor man - I really wasn't very fair - | Please forgive me - except for feeling that I had behaved abominab[ly], just at the end, I thoroughly enjoyed my most excellent luncheon'. 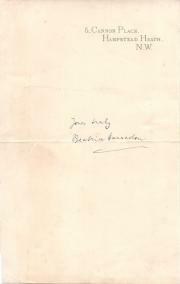 Autograph Signature of the writer and suffragette Beatrice Harraden, on her letterhead. Undated. On letterhead of 5, Cannon Place, Hampstead Heath, N.W. 12mo, 1 p. Fair, on aged paper, with central horizontal crease, and traces of mount adhering to reverse. In response to a request for an autograph Harraden has signed, neatly in the centre of the page, 'Your truly | [signed] Beatrice Harraden'. The signature is underlined. 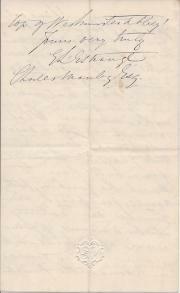 Autograph Letter Signed from 'E L'Estrange' to Charles Manby, proposing to present a copy of the [her?] three-decker novel 'Westminster Abbey' [by Emma Robinson]. 9 May 1854; no place. 12mo, 4 pp. Bifolium. 51 lines. Text clear and complete. Good, on aged paper. 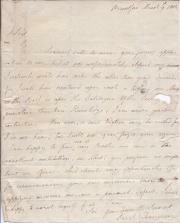 Chatty and spirited letter. 'I propose myself the honour and pleasure (seldom indeed, save in common parlance!) of paying you a visit, - to present you with a copy of "Westminster Abbey"', which has 'emerged from the press in the orthodox three volumes'. Does not want to give him 'an excuse for not flashing your eye through it'. Autograph Signature and short note. On piece of paper roughly 4 x 7 cm, cut away from letter. Very good on lightly-aged paper. Laid down on piece of paper removed from autograph album, headed 'Women of Note' and dated '1895'. Reads '[signed] Emily Faithfull. | Mr L Mrs. Faithfull Begg's your card for I want you to know each other'. Burslem Wesleyan Methodist Sunday School. August 30th, 1835. Afternoon Service. Autograph Card Signed ('Julia AE Roundell') to 'Miss Wilson'. 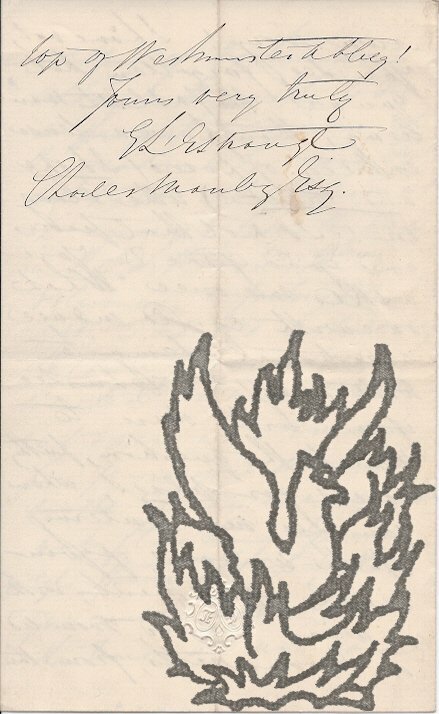 7 October 1896; on letterhead of Dorfold Hall, Nantwich. On both sides of card, 9 x 11.5 cm. 16 lines. Text clear and complete. Good, on lightly-aged card. Gives dates when they will be in Curzon Street. 'I do hope that we shall find you better. My little red book [possibly a pamphlet printed for private circulation, containing recollections of Gladstone] seems to satisfy everybody, which is an immense pleasure to me'. The book and photograph have delighted 'Agnes Jones' sister', and she has 'letters from Mr Gladstone & Mr Rathbone, & a leader - not a mere review - in the Manchester Guardian'. 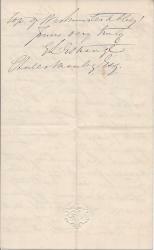 Autograph Note Signed ('C M Yonge') to unnamed woman. 19 December [no year]; Elderfield. On one side of a piece of paper, 9.5 x 7.5 cm. Very good, on lightly-aged paper. Minor traces of stub in thin strip along one edge. Reads 'Elderfield | Decr 19 | Dear Madam | The Story you mean is in the Christmas number of the Monthly Packet for 1877 | Yours truly | [signed] C M Yonge'. Docketed on reverse in a contemporary hand 'Miss Charlotte M. Yonge Authoress of The Daisy Chain etc. etc. etc'. Handbill headed 'An Appeal to Working Men and Women', pressing for 'the English law to protect your girls from being led into vice'. January, 1885. 41, Great Russell-street, British Museum, W.C.
On both sides of a piece of paper, 19 x 11.5 cm. Seventy-seven lines. Text clear and complete. Fair, on aged and lightly-worn paper. Contrasts the law on the continent with that in England, where 'an unruly girl at any age can go on the streets, and the person who harbours her is not guilty of a greater crime than if she were a women [sic] of thirty or forty [...] Will you not help us heart and soul in getting our English girls, - your daughters, remember, - as carefully protected as Belgian and French girls? 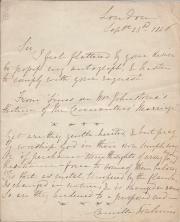 Autograph Letter Signed ('Bessie R Parkes') to Lady Kay-Shuttleworth. 28 December 1861; 17 Wimpole Street, London, W.
12mo, 1 p. Ten lines of text. Fair, on aged and lightly-creased paper. She received the cheque the previous night, and is sending 'a prospectus [not present] of the Home to which the Patient was removed'. She thanks her for her 'prompt kindness'. At the time of writing (six years before her marriage to the French lawyer Louis Belloc) Bessie Parkes was co-editor of the 'English Woman's Journal'. Lady Janet Kay-Shuttleworth (née Janet Shuttleworth) was the wife of Dr James Kay-Shuttleworth (1804-1877), one of the leaders of the Liberal Party in Lancashire.